Summary: Jess and his family are black market smugglers who trade in the rarest and most dangerous of commodities: Books. The Great Library that rules over the world allows people to download and read things, of course, but very few people are allowed to actually own bound copies of books. In order to get an inside look at the mysterious agents who run the Great Library and it’s satellite locations all over the world, Jess is convinced by his father to apply for entry into the elite Library training program and soon he is on his way to Alexandria, Egypt. As he makes friends and enemies in his class and clashes with his surly, aggressive mentor, Jess begins to realize how seriously the Library takes its stance on the value of knowledge above everything else – including the lives of enemies, innocents and the trainees themselves. When his friend comes up with a radical idea that could change the way information is transmitted forever, Jess must decide what is more important: His family and the mission they have set before him, or exposing the secretive and deadly nature of the Library. Either decision will cost him greatly and be impossible to forgive. One of the great intellectual tragedies in history was the legendary destruction of the Library of Alexandria. Although there are several different theories about what happened and when, what is not in doubt is that countless scrolls containing works by famous authors were lost forever. This imaginative and fast-paced tale imagines a world where the library not only survived, but managed to become the ruling entity of the entire world. Short communications before each chapter give you a sense of what’s to come and the larger scope of the story as you read, compelling you to keep turning the pages to see how it all works out. There is something here for almost every reader: Action, humor, romance and mystery. This thrilling adventure will leave you begging for the second installment of The Great Library series. Who will like this book? : Fans of dystopian series like Divergent and The Hunger Games. People who love books. If you like this, try this: The Archived by Victoria Schwab. The Eyre Affair by Jasper Fforde. Inkheart by Cornelia Funke. Summary: Karou lives in two worlds. In one, she is a multi-lingual, blue-haired art student living in Prague who fills her sketchbooks with beautiful monsters known as Chimaera. In the other, she is the ward of one of those Chimaera slipping through magical portals throughout the world collecting teeth for his devilish creations. Karou loves the Chimaera who have raised her, but she can’t help wonder “Who is she?” While her guardian provides much, his demands are great and he leaves so many of her questions unanswered. Then black handprints begin to appear on the doorways of the portals used by Karou. Her secret world and beloved Chimaera family are threatened by Seraphim or angels, creatures unlike any found in biblical writings. Further complicating Karou’s life are the confusing feelings she has developed for the creature who attempted to kill her. Soon, Karou discovers that she is at the center of an otherworldly war. She may finally find out who she is, but at what cost? Who will like this book: Those who have long since graduated from Twilight and its countless read-a-likes will be enthralled by this original fantasy. Laini Taylor has vividly created a new world populated with unique characters and combined it with traditional themes of forbidden love and epic war. Summary: In the final installment of this outstanding series, Percy and company must defend the island of Manhattan from the evil Kronos and the monster Typhon. 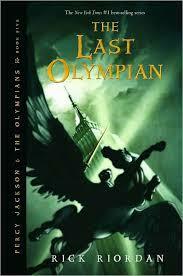 The Last Olympian has the usual plot twists and turns, but the stakes are incredibly high: If Percy, Annabeth, Grover and the other demigods from Camp Half Blood lose the battle, civilization as they (and we) know it will unravel as the evil Titans take control. If you haven’t read Percy yet, by gods, what are you waiting for! Begin with The Lightning Thief before the movie hits theatres. Who will like this book? : Everybody! A great adventure series for guys and girls who don’t love to read, mythology buffs and everyone in between. This is also an outstanding series for teens and parents to share. If you like this, try this: The Keys to the Kingdom series by Garth Nix. The Mark of Solomon series by Elizabeth E. Wein. And it looks like there will be another Camp Half Blood series, featuring new campers, so keep an eye out for that as well.